Giant Heptathlon is an exciting competition format for Secondary One and Two year groups. It provides a great opportunity for Secondary Schools to introduce the basic principles of athletics within a fun, team-based environment that can be used as part of PE curriculum sessions or in a more formal competitive structure within the school or across local authority areas. 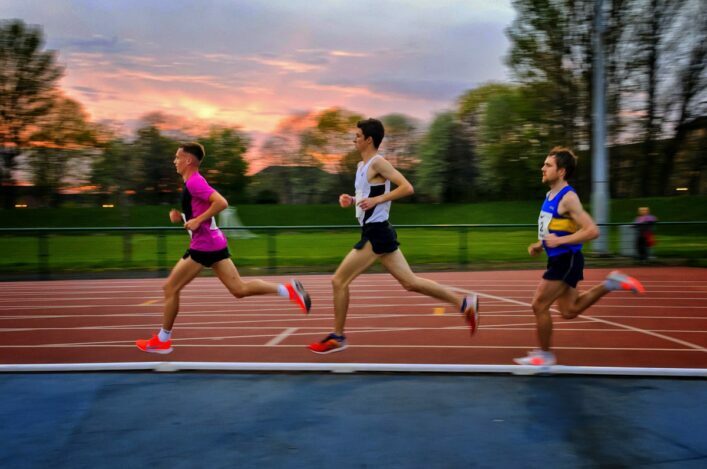 Teams (schools) engage in a range of athletics-based activities that encompass sprinting, hurdling, relays, endurance, jumps and throws with indoor and outdoor versions available. Athletes work around seven stations, taking part in each event and the sessions can be delivered over 2-5 hours depending on the time available. Various resources are available to schools and more information can be downloaded below. The resources include detailed information on how Giant Heptathlon events work, sample timetables, letters to schools, equipment lists, rotation sheets and the simple scoring sheets. This year, scottishathletics have re-introduced Regional Giant Heptathlon Finals, having reviewed last year’s virtual event and taken on board the feedback that was received. The Giant Heptathlon events can be held in either a small gym (2xBadminton Courts), large games hall (3+ Badminton Courts) or Indoor Athletics Facility. It is designed to fit into all these spaces with minimal difference between all events. Our recommendation is that schools take part in local authority or cluster events with the winning school going through to the Regional Final. A virtual National winner will be announced once all the scores from the Regional Finals have been entered into a league table with point’s tallies and the overall National winner will be identified. Overall scores will now be done electronically and the master score sheet can be downloaded. If you are unable to complete your results electronically, contact you National Club Manager who will be able to give you an alternative scoring sheet system. Scores for the Regional Finals will be calculated using the Electronic system. The winning school nationally will be presented with an award alongside an international athlete visit. For more information about events in your area or how to become involved please contact your scottishathletics National Club Manager.